"Ow!" a lioness said. Zira tumbled out of the bush. "Erm...hello Taka." she smirked. Taka nodded and said, "Why aren't you with the others?" "I'm sure they'll manage without me. How have you been?" "Fine. I'm fine." he said. He got up and they embraced. "I've missed you." he lied. She just wasn't what he needed right now. A nice, juicy Zebra leg would be nice, though. "Is 'life still good for you here'?" he mocked her. Zira opened her eyes and looked at Taka. "You know we can't leave." she said. "Right. Your family needs you." he said coolly. "Oh, please. They don't need a leader anymore. Not with my brother strutting around." "Anything! Anything to know that you're up there. Give me something just this one time. I'm lost. Please help me…I'm so lost." A tear merged with the rain water that ran down his face. "Help me find out where I belong. I'm asking…no…I'm begging you. Please answer me." He dropped his head down, starting to cry. He collapsed in the muddy earth and buried his head in his arms. "Just..this one time...please. I am the King's son...please...answer me. Answer me!" He looked up. The storm clouds enclosed the last few stars and darkness fell over the Pride Lands. "Why are you abandoning me? Please... lend me your wisdom." he coughed. Mud was in his mouth. "Am I not sincere enough?!" He spat it out and gritted his teeth. He shook his head and looked down again. "Fine" he said, "I'll do this on my own. My father's stories got me talking to a bunch of damned stars." He got up, still covered in mud. He could hear the hunting party over the rain. He saw that they had captured a Zebra. Perhaps the Kings favor me afterall. he said contemptuously. Taka ran over to the pride and began consuming the animal. Well, for as short as this chapter was Moka, it was awesome. ^^ Loved your use of description and you really brought out the essence of the scene. I feel so bad for Taka and that's saying a lot since of course we all know how he turns out, but it's just heartbreaking to read such a tragic past for such a vile character, you know? ^^ It's odd, but you can still feel the odd chemestry between Zira and Scar, even for the short time they interact. lol. Maybe that's just me thinking too deeply into the matter but I look forward to reading more of your fantastic story when you post it my friend and I'm curious to know how everything is going to play out. It's just so exciting! Don't keep me waiting too long for the next awesome chapter. lol. You have a terrific amount of material here =) Let me first say congrats for getting this far! You do a great job trying to dig into Scar's personality in this scene. Scar as a child is something I've always found interesting, and you show him in a very believable way for me =) good work! I can't wait until you post more chapters. =D I was really engrossed in the entire story; you're an excellent writer! Awesome fanfic so far Moka! Really love it! Since it has Uru who I love!! Sig by Simbaholic, userbars by WildSimba and Simba. He heard a warm voice behind him. It was his mother. "Taka, where have you been?" she asked. "That was a powerful storm, I was worried." "I'm fine, mother." he said, not turning around. She stayed with him that night, keeping him warm and shielding him from the cold breeze of the night. He didn't tell her this, but he was grateful for her company. "Taka, wake up. 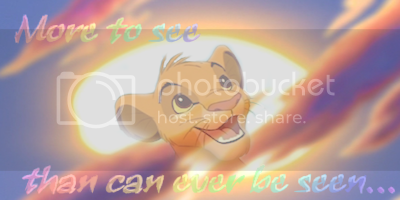 Are you still bothered by Mufasa's decision?" She asked. "I just found out that my entire life will be meaningless." He said quietly. "I might need a day or two to recover." Her heart sank from his cold words. "Taka...don't say such things." She said. "Come with me, let's go for a walk like we always did when you were just a cub." "When I was just a cub, I believed that I was important. Now it doesn't matter." "For you." He said, getting up. "Because you're the only one who has ever been honest with me." "Thank you." She said, as they walked out of the den. "Look at me, son." She said to him. "What did you notice during our walk?" She asked. Taka raised his eyebrow and said, "What?" "I watched the sun cast a red hue across the bountiful lands that have been bestowed upon us. I watched as the lands became busy with abundant life, watched as the birds sprang from their nests, watched the ants begin their ascent high into the acacia trees. I watched the gazelles and wildebeests and zebras graze in peace and harmony, watched as the savanna grasses glistened from the night's dew and swayed in the cool morning breeze. So, I ask again. What did you notice during our walk?" "It was cruel of you to put me in this position." He replied. "I'm teaching you that we can only find the good things in life if we are open to them." She said. "If you keep your head down and ignore it all...well, you'll miss out on a lot of beautiful things." "And tomorrow I will ask you what you remembered about today. Will you remember the birds and the grass? Or will the fact that our family is based on lies make you forget?" "A long time ago, when you were young, you made me a promise. You promised me that you would not become jealous of Mufasa. Do you remember?" "As a cub I was willing to listen, but nothing you can say can heal me now. I am not jealous of Mufasa. I never was and never will be. I would never envy someone who breaks promises and lies to claim kingship and power. Yes, I remember the day I made that promise. You said I should not desire what others have. That I have a home, a family and a heart, those which matter most. Well I've lost them. The home which I considered mine was taken from me when I was denied my right as king. My family betrayed me and my heart? Please. A heart which was so easily scorched by the conceited lies and hate which everyone seems so eager to dole upon me. No, mother, I've lost what matters most. I know what you're trying to do, but don't waste your time on me anymore."